Most pool companies specialize in either vinyl or fiberglass pools. Hence, when you read their websites, you’ll get the idea that the one they sell is ideal, while the other is a truly bad decision! Actually, there are pros and cons for both vinyl and fiberglass pools. Aqua Pools works with each customer to determine the best decision in their particular situation. Though, by numbers, there are more vinyl pools than fiberglass pools in and around Chicago, the fiberglass pool industry is growing the fastest. That trend is nationwide. The expanding popularity of fiberglass is due to several factors. First, there is generally less maintenance involved with a fiberglass pool, both in the long term and the short term. Liners don’t need replacing every few years, and the nonporous surface allows for stronger chemicals to be used without damaging the surface of the pool. Fiberglass is also quite tolerant of the continual, and sometimes very rapid, freezing and thawing of the ground we see here in the Midwest. Since fiberglass pools are manufactured off-site and then delivered to the customer’s home, the installation process is generally faster. Fiberglass pools offer an amazing array of features, including gorgeous tile borders, tiled stairs and seating, creative tile mosaics in the bottom of the pools, and built-in water features, such as cascades and custom LED lighting. Customers also enjoy the in-floor cleaning systems available on our Viking fiberglass pools. The primary disadvantages of fiberglass pools are that these pools do cost more up front, and you can’t customize a fiberglass pool like you can a vinyl pool. While manufacturers continually offer fresh, innovative designs and styles, what the manufacturer has available is what you get. But the easy, low-cost, long-term ownership of fiberglass pools, along with the durability and available features, drives strong sales in the fiberglass pool industry. Vinyl is popular around the Chicago area, too, partly because vinyl liners have been around longer than fiberglass, and partly because they’re less expensive to install than fiberglass. The benefits of a vinyl liner pool include the ability to totally customize your pool. 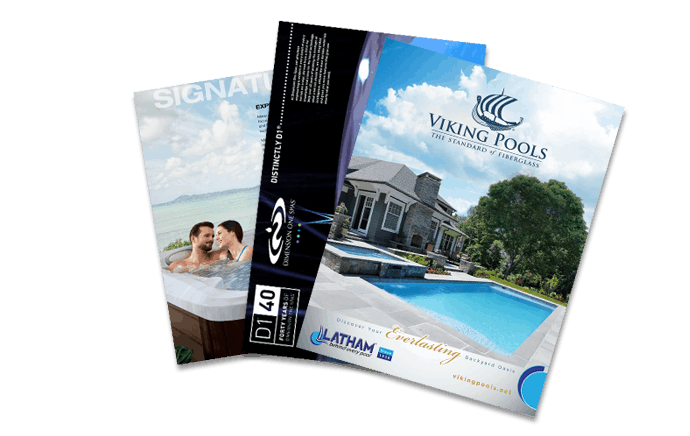 Whether you want a luxurious lagoon-style pool or need flexibility in design to overcome space or layout challenges in your backyard, you can get whatever shape, size, and style pool you want when you choose a vinyl liner pool. The interiors of these pools are always smooth, meaning the sides and bottom don’t snag swimsuits or scrape the skin like a concrete pool would. The primary downside is that the vinyl liner needs to be replaced once in awhile. But many customers like the fact that they get a new, updated look for their pool on a somewhat regular basis. You aren’t stuck with something decades after styles have changed. Vinyl liner pools are typically constructed using steel or a structural foam, known as Polymer.